Invasive and exotic animals have long been common subjects of scarelore, and messages alerting readers to the supposed threat posed by some new or previously unheard-of species often spread like wildfire across message boards, social networks and email inboxes. These posts typically take the form of a “public service announcement” and are shared in good faith, and without hesitation, by people who sincerely wish to alert their friends and loved ones to an unfamiliar threat. For these reasons, the “dangerous animal alert” is also a frequent source of misinformation, deliberate scare-mongering, or even downright trolling. A viral, scare-mongering Facebook post fabricated a series of fatal spider bites and used photographs of the relatively harmless woodlouse spider. 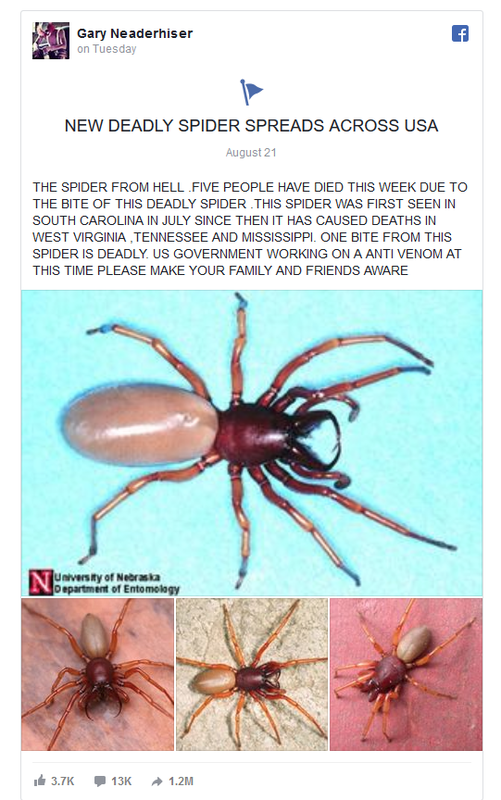 On 21 August 2018, one Facebook post went viral after it warned of a “new deadly spider” breed which was purportedly spreading across the United States and had killed five people in one week. The spider shown in the photographs is Dysdera crocata, known variously as the woodlouse spider, sow-bug killer, woodlouse hunter spider, pill bug hunter, and Stiletto spider. Dysdera crocata is a hunting spider found from New England to Georgia and west to California. It is also a commonly encountered spider in England, northern Europe, and Australia. The woodlouse hunter preys on pill bugs or sow bugs … D. crocata bites have been implicated in causing a localized, intensely itching erythema 4 to 5 millimeters in diameter. The bites apparently do not result in any systemic neurotoxicity or cytotoxicity.